So you’ve finally found/finished building your dream home, but what about your dream closet? While closet space is nothing but a neat storage to some, it is, to many, a personal haven—a place to keep their personal effects organized and in good condition. After all, the time you spend getting ready in the morning could very well affect the way the rest of your day would go. A well thought out closet plan and storage solutions can therefore be hugely beneficial not only to your morning routine but also to your daily comfort, with the added bonus of an uncluttered room where you can completely relax and enjoy your clean space. What types of storage cabinets and closet solutions have you worked on? What style do you suggest or recommend for the space available? What exterior changes must be done to accommodate the new closet? How much will a new custom closet cost? What is the timeline for the project? 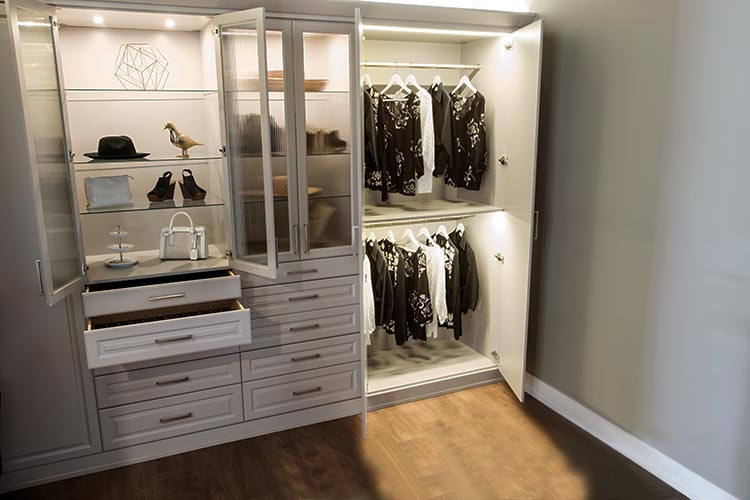 Schedule your professional in-home consultation with Space Age Closets and Custom Cabinetry—one of the best in-built custom closet organizers in Vaughan. They specialize in personalized storage solutions that are designed to meet your unique lifestyle needs and cater to your space restrictions. Space Age brings fresh ideas for built-in wall storage units, reach-in and walk-in closets, laundry rooms, bathroom and kitchen cabinetry, window seating, and so much more. © 2018. Space Age Closets & Custom Cabinetry. All rights reserved.